Our Set's feature is finally getting some long neglected loving. Currently, it's very powerful but far too confusing. We get more complaints about how Set's work than any other part of the App. 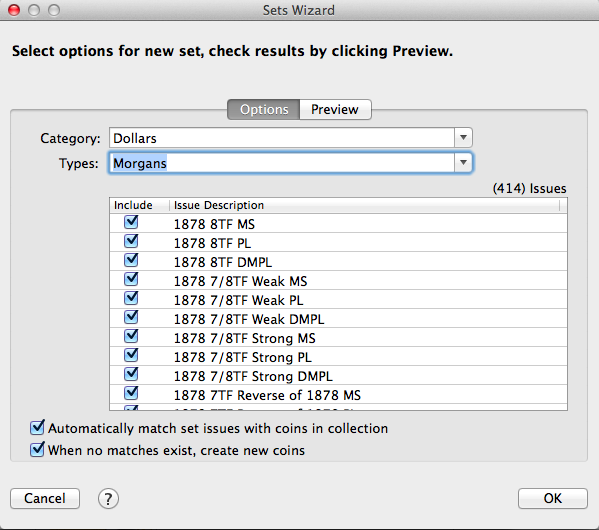 You will be able to Include / Exclude individual coins in the series from being added to the Set. The App will optionally automatically matching issues in your collection, & add those to the Set. The App will optionally automatically create new coins for any coins that you don't have. I'd like to hear any feedback on how YOU would like to see adding +Types to new Sets should work. The whole point of the +Types option is to allow you to add dozens of coins to a Set automagically, saving you perhaps hours of work manually adding coins one-by-one. The most common complaint I get, coins being added that you don't have and will never have. So I'm working on making this easier to understand & configure.